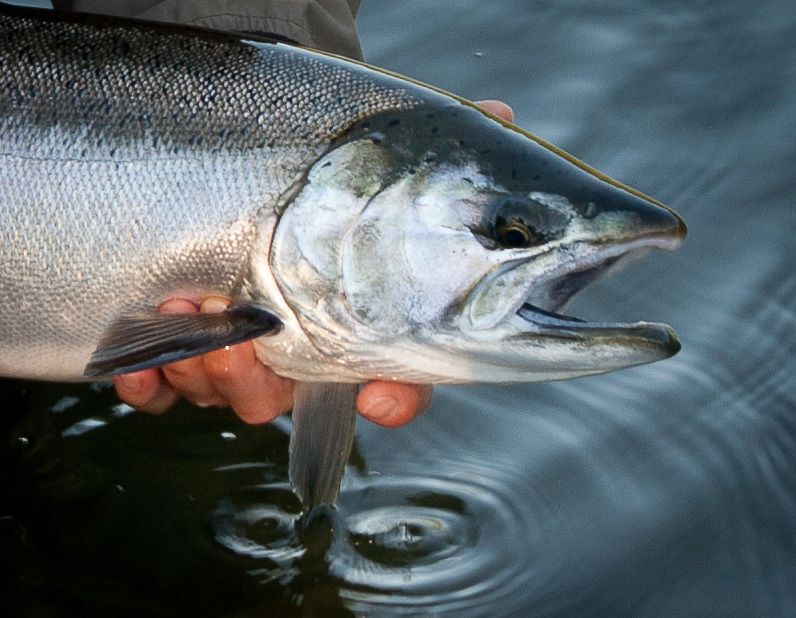 The beautiful chrome of a large silver salmon glowing gold from a breaking sunrise. 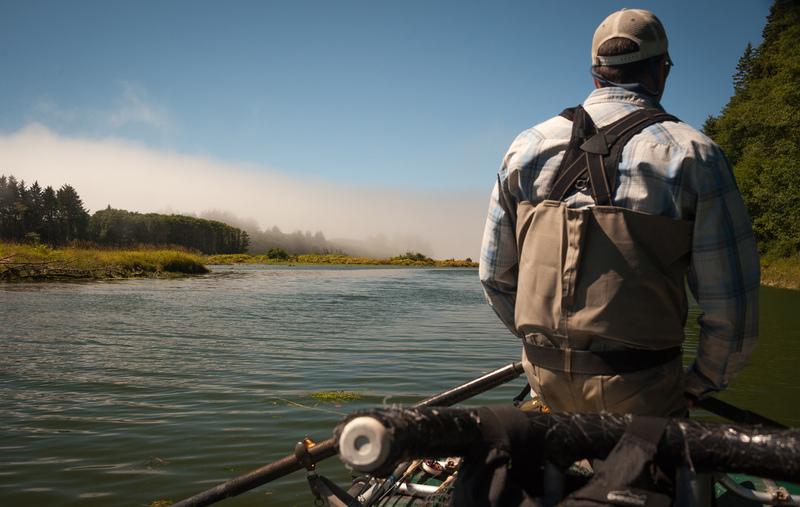 Caught by Skip while fly fishing wild western Washington with guide Jim Kerr. Hmmm, I wonder, why only 3,500? If you don’t happen to live in Sekiu or Joyce or one of the few other much smaller (honest!) 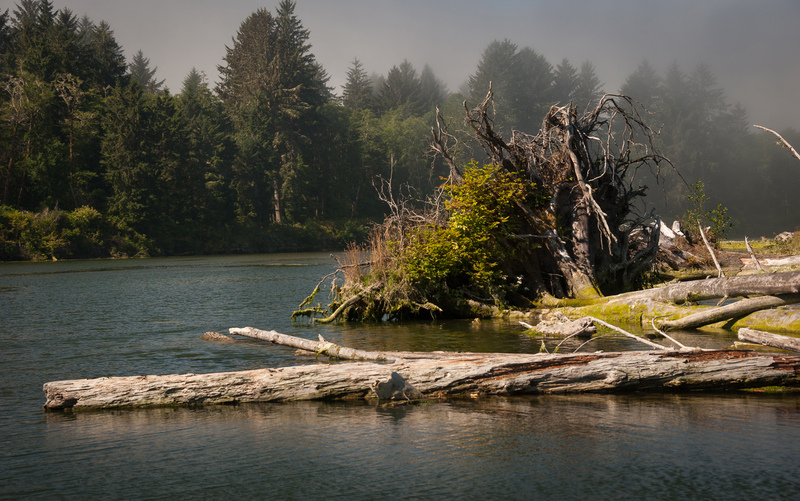 towns within 50 miles of Forks yet have heard of Forks, then that’s probably because you’re familiar with the Twilight vampire/werewolf craze whipped up by a series of books and movies set in that soggy hamlet. Or else you yourself are a vampire or werewolf with a sense of community who consequently keeps up on group-related news, such as rain-soaked little bergs where your sort gathers. Outside of Forks, it gets primitive fast. The Olympic Mountains, rivers running uncorrupted through federally protected primeval forest, surf, and magnificent beaches with amazing rock formations, all—and this is a particularly apt use of the word—pristine. On second thought, joking aside, I really do wonder why only 3,500… Though I’m pleased about it; wouldn’t be the West Side anymore if humans swarmed it. Early morning sun breaking through the fog on Washington's wild westside. Jim guides often for salmon and steelhead, but less often for the fascinating sea-run cutthroat trout that run to west-side rivers and creeks. Oddly, with as many sea-run fanatics as there are in Western Washington, few seem willing to drive a few hours to the ocean side of the Peninsula to go out after these hard, fiery, and intriguing sport fish with Jim. But my wife, Carol Ann, and I hesitated not a moment to say Yes to Jim’s invitation to do just that. It’s been a horrid year for water in Washington—the worst—rarely a sprinkle of rain, and plain hot. Crossing the Sol Duc River a few times on our drive out, Carol and I looked down from bridges to see a lazing shallow flow surely too warm to please trout and salmon, with much of its structure of boulders and gravel bars baked white in air and sunshine. And it was still only July. So, to protect the fish we caught under such dire conditions, Jim took us to the tidal stretch of a big river where the ocean provided the fish plenty of cool water. And, he took us early, when the river was as cool as it would get. We met at 5:00am the first morning, Carol and I staggering in a daze. But we soon snapped out of that. 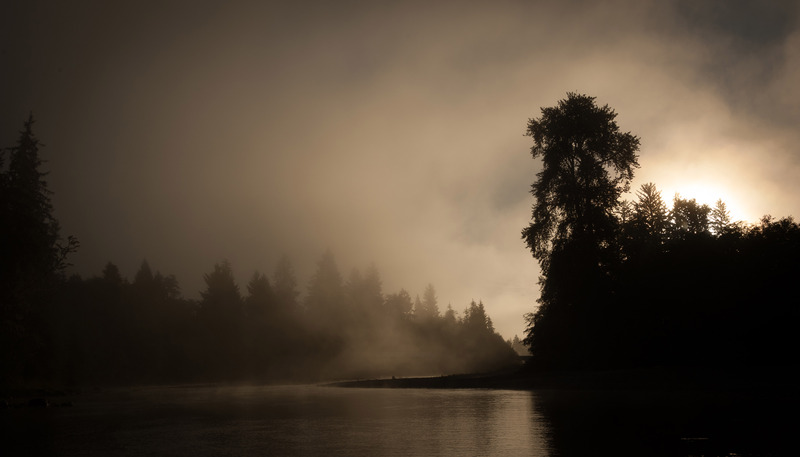 Skip readying the rod to fish for silvers in the early morning fog on Washington state's primitive Olympic Peninsula—with fly fishing guide Jim Kerr, owner/operator of Rain Coast Guides, looking on. Skip casting through the fog in the hope of hooking into a big silver. Only five or ten minutes into our fishing the first fish took my fly—or, more accurately, simply stopped it. I struck, and found myself fast to a salmon that was coming in far too lazily. Suddenly it became clear that I hadn’t yet sufficiently annoyed the big fish. He flew up and out in a rage. From there it was a game of keeping the line clear and jerking my hand clear of the reel whenever he got the urge to sail off again on another fine run. I’d brought a large reel loaded with backing. He showed me at least 100 feet of it. In the net, we guessed him at around ten pounds, the brightest silver a silver salmon could display, so fresh he was probably down swimming among jellyfish the day before. It went on this way through two more salmon and three failed salmon hook-ups. That’s when Carol decided to trade camera for rod. The sun was throwing its first glare on the water when she started, and Jim said that that would only make things tougher. wild waters of Washington's westside. But Carol had decided she was going to hook a silver, and only a fish that’s a fool takes lightly the determination and instincts of veterinarian Carol. She bent in concentration, trained her gaze on the gray depths of the slot. The sun continued its climb to wash the pool in angled sunlight ever stronger and make a hook-up ever more unlikely. Then Carol let out one of her whoops, a sound I’ve loved from the first time I heard it (about 25 years ago) back when she hooked her very first fish on a fly. Another shining salmon took off and her reel was howling in alarm; actually, so was Carol (she’s naturally a quiet fisherman…until she hooks a good fish). A few runs later it lay in the net, six pounds of stout chrome. Moments after that it was slipping back into the river, winded, but with no more than a dentist’s stab in the gums to show for its troubles. 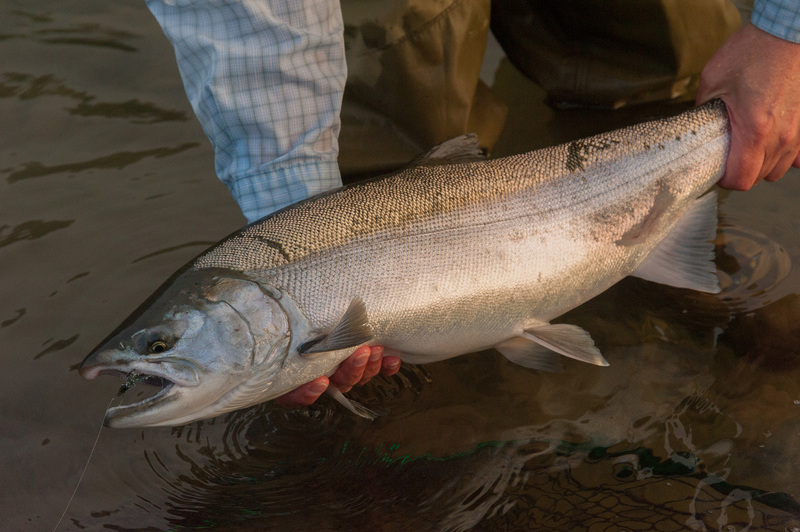 Carol's catch—a bright silver salmon brought to the net, and ready to be released. The rest of the day we chased sea-runs, caught some, saw flounder we never hooked up in pools that still were pools, before the tide had opened them up, and generally had a fine day. Or, half-day; we quit around 1:00. 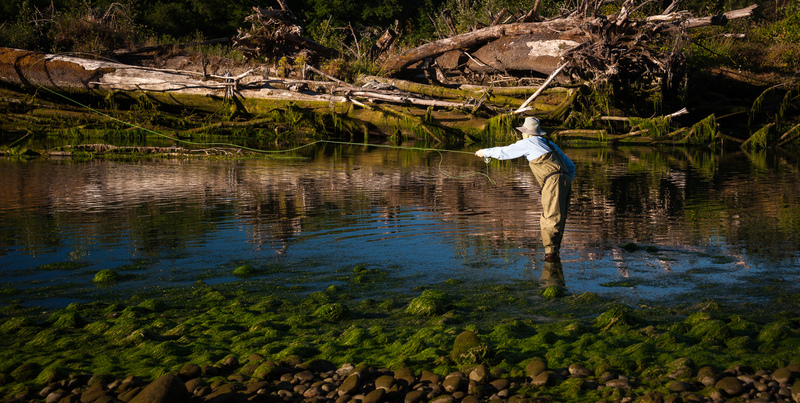 Skip fishing a tidal pool for searun cutthroats on Washington's rugged Olympic Peninsula. 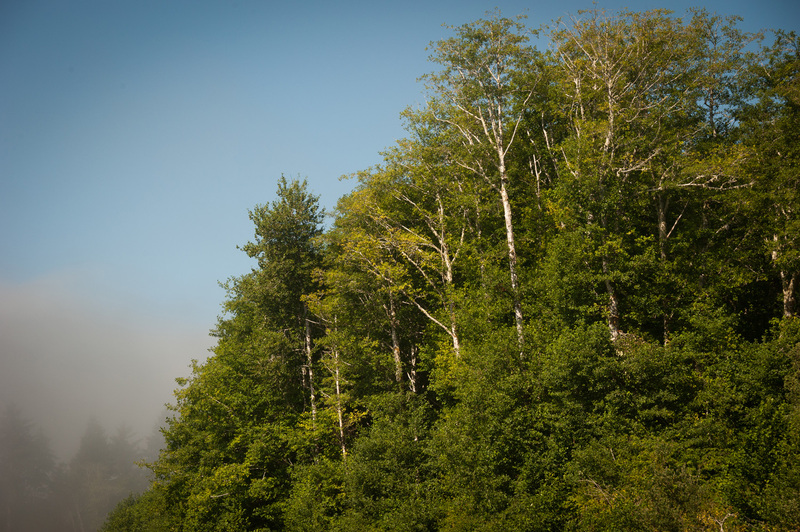 Just before we left the water, Jim rowed us around a corner of steep tree-shaggy banks to reveal the Pacific Ocean, framed on its sides by steep, tree-shaggy hillsides, and seeming to fade off into infinity. The white layers of the surf, the broad beach, a rock island rising in mist… What a final scene of the day. Briiiing—Will Somebody Kill that Alarm Clock! Next morning, up early again, we were off to the same tidewater section of the river. We launched; then Jim rowed upstream and pulled the boat ashore. He said it was worth a few casts to walk up to a pool carpeted with the kind of yellow-green vegetation I’d grown up seeing on Puget Sound beaches, and it lay slick all over the gravel bar edging the pool too. Other than that, and the high stack of driftwood on the far side, it could have been reckoned a fairly classic trout pool. We cast, worked our flies, nothing. We moved up to the next pool to fish the tail-out. Again nothing. So we walked back downstream to where the low tide left a good chop of current from the pool to what was currently the river’s mouth. All through the current were sea-runs. I hooked plenty, lost some, landed some, on a smaller Morris Minnow. Carol twitched a dry fly, I think… Anyway, she hooked, landed, and lost her share too. Once the chop had given us all it could, Jim dragged his raft upstream and over the thin lip of the pool. Carol and I climbed into the high, comfortable seats at the raft’s ends. The pool just went and went, on upstream, and we teased at sea-runs that weren’t there by twitching dry flies. Eventually, we found a trout or two, but we switched to streamers anyway, confident they’d improve our odds. Fishing remained slow until we came to a shallow edge that didn’t look like much, and Jim stopped the raft. We said nothing—again, we knew to trust Jim. Late morning fog on the tidewaters of western Washington. The low water was very clear, and back where it was too shallow for any sane trout to hold, we watched one slide smoothly out to grab one of our flies. After that it was good, steady sea-run fishing—and fascinating, with everything in full view like that. Striking silver on Washington's wild westside. In one shallow spot nearly as still as a pond, a huge sea-run appeared behind my fly, moving fast. I remained calm—or close enough to calm—to let the fish close around my Reverse Spider before I tightened on him. It was the perfect situation for me to overreact and snap even my 2X tippet, and I knew it, so I spoke to myself: “Relax, take your time, it’s just another fish…” But it certainly wasn’t just another fish. It wasn’t a monster sea-run either. It was another silver salmon, as shiny bright and wild-fighting as the others. Sure, my hopes of landing my biggest sea-run yet were dashed, but I couldn’t find a way to be disappointed. There was more good sea-run fishing during our float downstream; then we hit the full effect of the tide—our green, driftwood trout pool was buried under water, as was everything else we’d left. The driftwood heap standing high up on the side of our former trout pool lay half submerged. This whole stretch was entirely new water to me and Carol now. 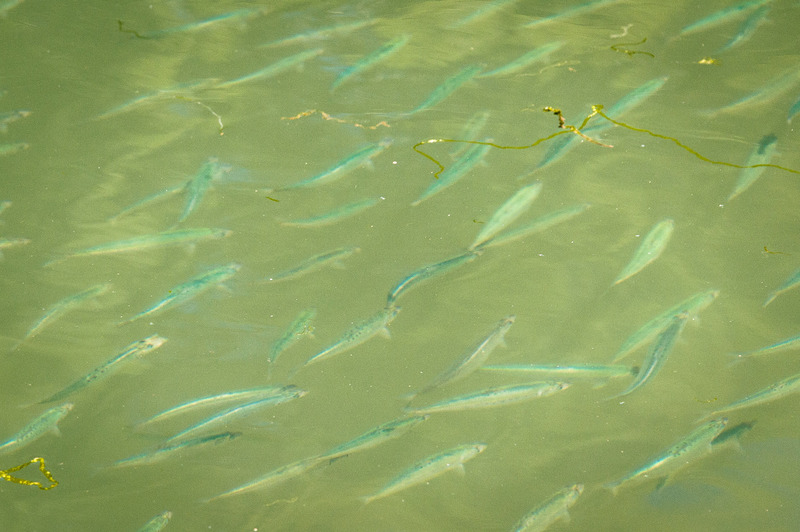 And just to prove it, a swarm of herring—a few hundred of them at the very least—swung by Jim’s raft. Welcome to Northwest tides—they transform everything around here that touches saltwater once or twice a day. wild tidewaters of the Olympic Peninsula. Carol and I cast, uncertain what to expect, and I hooked the unexpected: a small mackerel. Perhaps ten inches long it smacked my Morris Minnow, darted and fought and was finally ready to look absurdly small in Jim’s big net, but I avoided the awkwardness of an absurd fish-to-net ratio by waiting for Carol to get her camera going so she could photograph my first mackerel on a fly, and the fish came off. Over the next 40 minutes we got chases from mackerel to our flies, but none would get itself hooked. In a broad hole that formed suddenly in a dense herring school, a big salmon in its feeding prime of life swung through. Carol and I jumped to drop a fly near him but he was gone as suddenly as he had appeared. 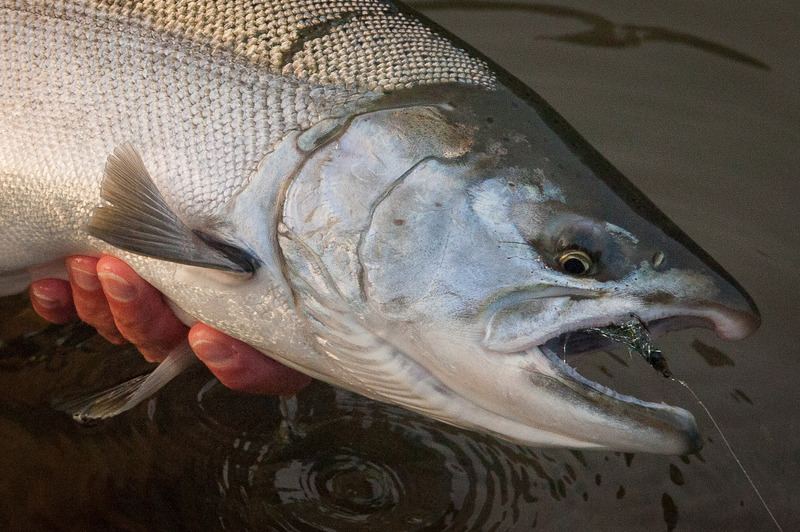 All those herring—it made perfect sense for a salmon to work the school. We saw no others, though. However, there must be times when a gang of salmon moves in to slash at those vast schools. No river salmon I’ve ever hooked fought with anything like the wild vigor of a sea-feeding salmon not yet mellowed by any stage of the spawning process. I’ve put it on my wish list: Fish Jim’s estuary when the salmon are in for the herring schools. All those herring—miniature cousins of the man-size tarpon of fishing legend… I had to try to catch a few. (Herring, not tarpon, that is. The water’s a tad…cool…around here for tarpon.) The fish were mostly darting and gliding on a plane about two feet down. The situation reminded me vaguely of trout feeding on Chironomid pupae in a lake, the fish all working at about the same level. So, without any more to go on than that I tied on a dry fly as an indicator, tied some tippet off the bend, and asked Carol if she had a trout-lake Chironomid-fly in any of her fly boxes. She had one suitable brown Gummy Worm (one of my patterns) and I tied it to the tippet, threw the rig out there. Nothing happened after a minute, even with the fly down among the close grey bodies of herring, so I gave the dry fly a tug. It darted back. I struck. Something struggled, then came off. So I tossed and tugged again and hooked another one. 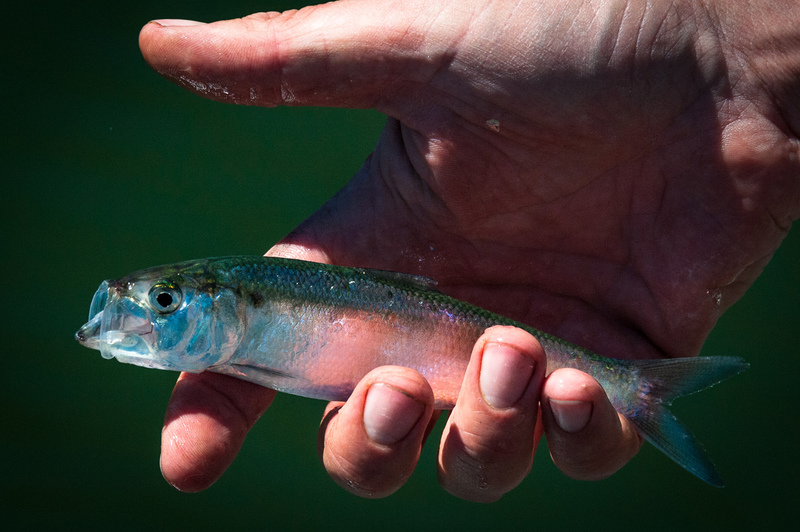 A bright herring caught on a chironomid imitation in western Washington. Fifteen minutes later I’d lost a bunch of herring but had landed six or eight of around seven inches long. My first herring on a fly…I wasn’t sure whether to be proud or alarmed. I was sure, however, that I felt delighted to catch a new species. Right… Probably not many. But, after all, how many can say they’re caught herring on a fly? I now belong to that select group who can. 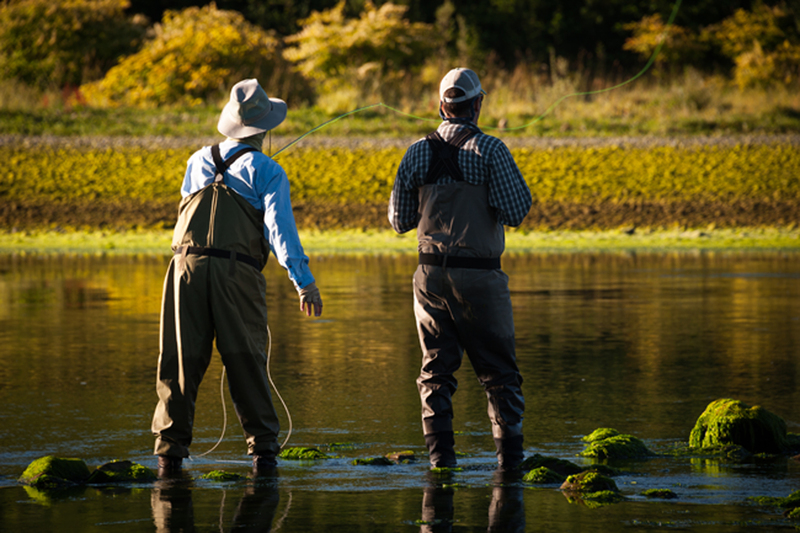 At the end of our two fishing days with Jim, it seemed clear that his Summer Fishing would make some modest demands on his clients—casting mainly: fairly long casts were often required. This suggests to me a modicum of casting experience; a two-season fly fisher who’s spent some casting-practice time on the lawn should be capable of the 50- to 60-foot casts we often made. A first-season fly fisher who’s packed in considerable practice time could probably do the same. Clearly, this is not expert-level fishing either. Not at all. But neither is it newbie-level fishing, fishing for someone who barely knows what it feels to pick up a fly rod. What it definitely is, however, is fascinating fishing that will inhabit my daydreams until I return to it. 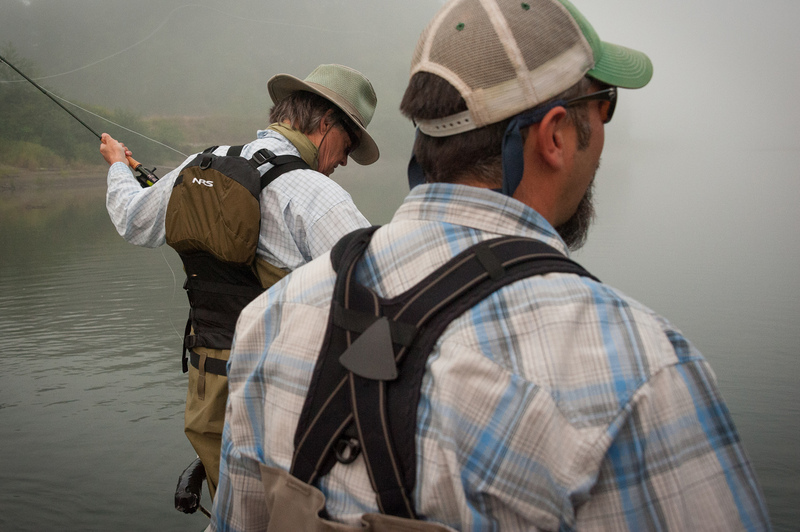 Skip casting into a tidewater pool hoping for a searun cutthroat (with guide Jim Kerr).